So here is my Two Paperdolls “behind the scenes” confession. 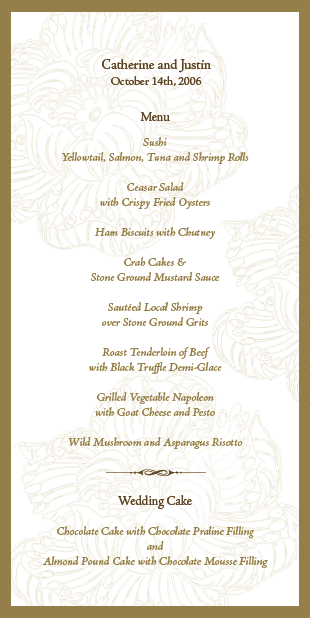 Whenever we print a menu card for one of our brides, which we do quite frequently, I take it over to my desk, tune everything else out and scour the meal choices to decide EXACTLY what I would sample if I were a guest. And after I’ve made my choice between the chocolate truffle wedding cake and the passion fruit sorbet (who am I kidding, I’m going with the chocolate truffle) I can’t help but mentally catagorize the menu on my list of favorites. Is this menu in the top ten? Maybe even the top five? It’s cut-throat competition really. A couple of weeks ago, I came across a menu that undoubtedly makes the top five … I daresay it even creeped into my top two (my favorite of course being my own … maybe I’m a tiny bit biased). 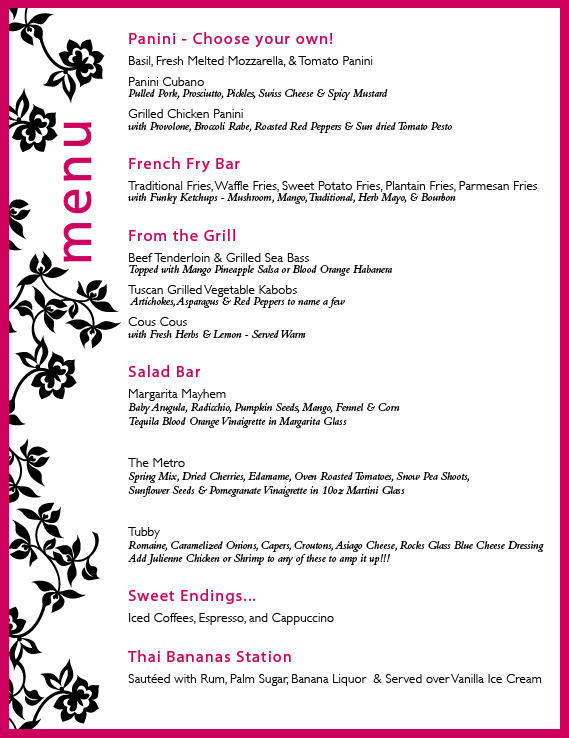 But any menu with a French Fry bar deserves a second look, and when I saw how creative our clients Jaclyn and Dan were getting with their wedding menu it got me thinking … Thinking that maybe it’s time we share a few collaborations between our clients and the extremely talented group of caterers they work with. So without further ado, I present you with my two favorite Two Paperdolls & Louella wedding menus. And please stay tuned for part II; next week I’ll post the rest of my top five! The only menu of the top five that I’ve actually tasted, the highlights for me were the shrimp and grits and the chocolate wedding cake with chocolate praline filling. Neither of us ate more than a bite or two at the reception, but we were lucky to be sent away with a serious assortment of to-go boxes. In the end, our first married moments alone were spent munching (me on the shrimp, Justin on the crab cakes) in our hotel room. And my mom managed to escape the reception with the entire top tier of chocolate cake, which made a fantastic breakfast dessert the next morning. For all of this we can thank the caterers at the Charleston Place Hotel. They came up with the perfect assortment of Southern treats for vegetarian and meat-eaters alike, as well as rolls and sashimi for my sushi-addict hubby. We were luckier still to find the most delicious wedding cake around by Lady Fingers in Charleston. Jaclyn and Dan did a fabulous job of putting together a chic reception, while maintaining a playful atmosphere for their guests, and their menu is a perfect example. It’s no surprise that this creative meal comes from one of our favorite area caterers, Leila at Feastivities. While I wasn’t at this wedding, I have been lucky enough to snack on Feastivities treats at several bridal shows, so I know that these culinary creations looked AND tasted amazing. Highlights of this menu have to be the previously mentioned French Fry bar with traditional, waffle, and sweet potato to name a few. Not to mention the gazpacho shooters, watermelon kabobs, or carrot AND devil’s food cupcakes. Is your mouth watering yet? *We’d like to thank Jaine at The Bride’s Cafe for including us in her post about this amazing wedding! This entry was posted on June 18, 2008 at 5:11 pm and is filed under Mmmmm....	You can follow any responses to this entry through the RSS 2.0 feed. You can leave a response, or trackback from your own site. I just found your blog through “The Scoop” and I absolutely LOVE it! Your stationary is amazing! Love the colors, design, and simplicity!